WASHINGTON (AP) — Matt Wieters homered to back Tanner Roark, who went seven innings to win his third straight start, and the Washington Nationals defeated the Cincinnati Reds 2-1 on Sunday. The Nationals took three of four from the Reds and have won eight of 11 overall. Roark (6-12) allowed a run on seven singles and got a nice ovation when he made a diving stop on Billy Hamilton‘s comebacker to end the seventh. In his last three outings, Roark has allowed two earned runs in 22 innings (0.82 ERA) with 20 strikeouts and a walk. Bryce Harper had two hits including an RBI double and is batting .367 since the All-Star break. Kelvin Herrera worked the ninth for his third Washington save. 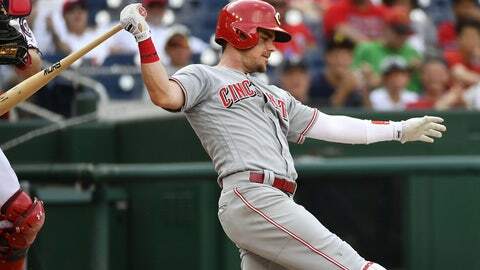 There was no carryover from Saturday night’s game — in which Harper and Joey Votto were hit by pitches — until the seventh when Michael Lorenzen‘s fastball sailed behind Washington’s Adam Eaton with two outs and Eaton glared at the mound. Harper started in center Sunday while Votto did not start but was called out on strikes as a pinch hitter to end the game. Cincinnati’s Luis Castillo (6-9) allowed two runs on six hits in 5 1/3 innings. Leading 2-0, Roark allowed four straight singles to open the fourth with Mason William‘s hit pulling the Reds within 2-1. Roark then retired Tucker Barnhart on a pop to short, struck out Brandon Dixon and got Castillo on a fly to right. Wieters made it 1-0 in the second inning when he sent a 2-0 Castillo fastball into the second deck in right and Harper’s third-inning double made it 2-0. Nationals: SS Trea Turner (0 for 9 in Saturday’s doubleheader) was not in in the starting lineup for just the fourth time this season. He was intentionally walked as a pinch hitter in the eighth. Reds: RHP Homer Bailey (1-8, 5.87) pitches the opener of the three-game series against the Mets Monday in New York. He’s 1-5 with a 7.22 ERA in seven starts versus New York. Nationals: After an off-day Monday, RHP Jefry Rodriguez (0-1, 6.86) and RHP Max Scherzer (15-5, 2.33) will pitch in a day-night double-header that opens a four-game series against the visiting Atlanta Braves.